This adapter will not adapt, convert or do anything with a DVI-D (DIGITAL) signal. This is strictly an analog adapter that is common to put into your DVI-I or DVI-A video card socket so that you can use a standard VGA cable to connect a Monitor or TV Display. I have a new AGIS MIS PC. Very powerful but only has a DVI and HDMI ports. Well, I have all 3 type connectors: DVI; VGA; HDMI. 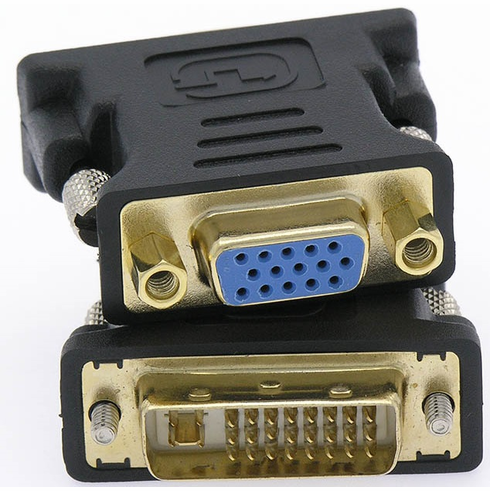 So, now I use this connector VGA to DVI and plug it into my Rocketfish splitter. I now have 3 functional monitors! Works great and takes up very little room. ProsShort; inexpensive; easy to install on your existing VGA cable.